If you downloaded The QODBC Desktop product between the dates of October 7th and 9th, this urgent message may apply to you. During the dates above a possible trojan infected version of the software was uploaded to our hosting company and you may have gotten this version. Only a few downloads were affected, and this version does not have our normal security key wrapper (Microsoft Authenticode) so it may be detected as not coming from us by your Windows system, which is true. Please uninstall any downloaded version of QODBC Desktop acquired on the above dates and install Antivirus software if you do not yet have any and run a full system check immediately. If no problems are detected, then you can download the latest version of QODBC from our website https://qodbc.com/download.htm and install it. Should you encounter any difficulties installing the latest version of QODBC Desktop or have any questions for us, please create a support ticket and we will try to get your issues resolved as quick as possible. 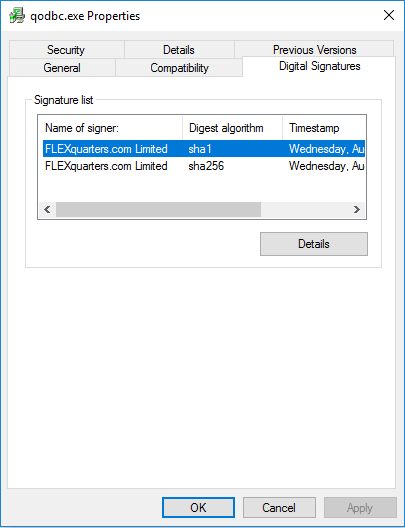 To double check, if you right-click the installer properties and tab to digital signatures you can view the security key is in place and that this is the valid secure download. We apologize for this disruption in our software and are taking steps now to ensure that only our security protected software will be downloadable by customers in the future. Thanks for being a customer of QODBC Desktop!